I'd like to see a selectable option for no fill under the Stroke and Fill submenu of the Table menu, similar to the Frame submenu. 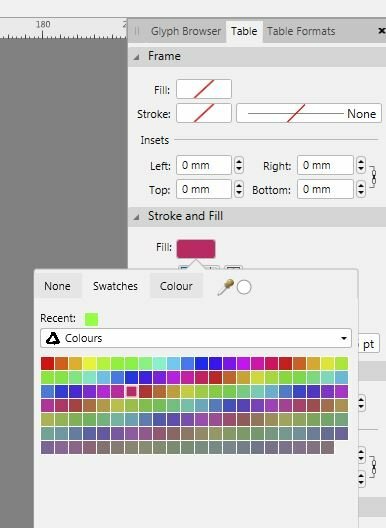 Currently if you only have colour applied to a number of cells you have to zero out the colour sliders to remove a fill. ... ok, I've found another way to remove the fill, if you click on the Fill under "Stroke and Fill" there's a tab labelled "None", seems a little odd but it works, I'd still like a standard visual similar to what's under the Frame submenu. I'd also like to have the ability to split a cell (horizontally and/or vertically) that has not already been merged. A agree about splitting cells that haven't been merged - that would be really useful.